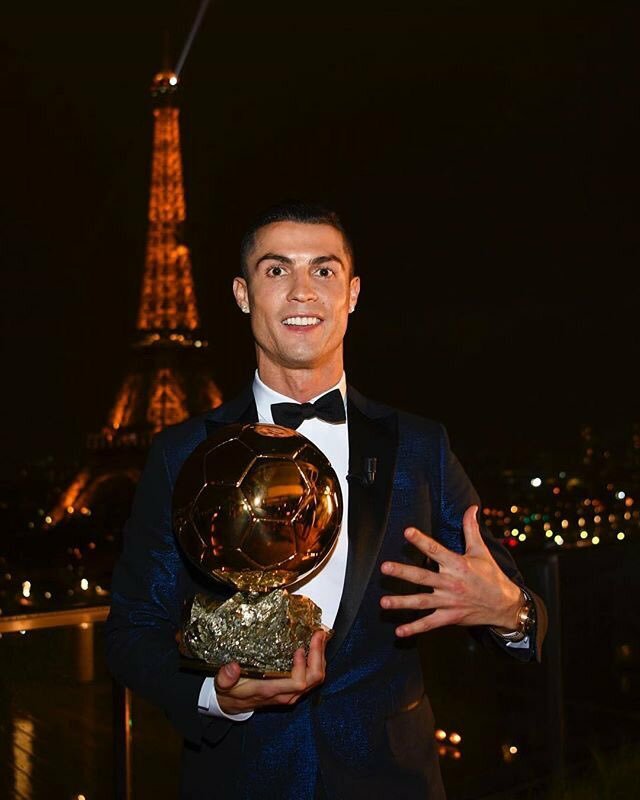 Paris, Dec 8: Portugal's Cristiano Ronaldo was honoured here with his fifth Ballon d'Or trophy as the world's best soccer player, bringing him level with Argentine striker Lionel Messi, who finished second in the voting for this year's prize. "I feel very happy, it's a fantastic moment in my career, I've been waiting for this for a long time," the Real Madrid star said at the awards ceremony in Paris, organised by France Football magazine on Thursday, reports Efe. "This year has been great, we won the Champions League and La Liga and, on a personal level, I was a top scorer in the Champions League," Ronaldo said, accompanied by his mother and his 7-year-old son. This is the second consecutive Ballon d'Or for the Portuguese international, who also took home the trophy in 2008, 2013 and 2014, while Messi prevailed in 2009, 2010, 2011, 2012 and 2015. The 2007 winner, Kaka, was present for Thursday's Eiffel Tower gala, along with Real Madrid club president Florentino Perez and a number of former Blancos greats. "I hope to play at this level for a few more years, I hope the battle with Messi continues, things happen for a reason," the 32-year-old Ronaldo said, going on to offer praise for Brazil's Neymar, who came third in the voting. "Neymar has a lot of talent, a lot of potential, and I'm sure he'll have some chance to win in the future," Ronaldo said. Besides leading Real Madrid to the La Liga with 25 goals, Ronaldo scored a dozen in the Champions League to help the Blancos become the first team to hoist the European trophy in consecutive years. For Portugal, Ronaldo scored 11 goals in as many matches to secure a spot in the 2018 World Cup.